Reproduced below is the obituary which was published in the Review of Religions, the monthly English journal of the Ahmadiyya Movement, in the April 1914 issue. Account of his joining the Ahmadiyya Movement, written by Dr Basharat Ahmad in Paigham Sulh, 7 November 1933. From the Review of Religions, April 1914, pages 143–148. All spellings of names are as in the original article. The Late Hazrat Moulvi Noor-ud-din. It is with profoundest regret that we announce the death of His Holiness Hazrat Moulvi Noor-ud-din Sahib, the first Successor of the Promised Messiah. He was about seventy-four years of age and had been confined to bed for several weeks. He left this world while offering his Mid-day prayer on Friday the 13th March at about 2 pm. He was the leader of the Ahmadiyya community and in his death not only have his followers lost their spiritual father but the world has lost one of the greatest saints of the age. His loss was bewailed not only by his followers and co-religionists but by Sikhs, Aryas, Hindus and others. Numbers of Sikhs and Hindus followed his dead body to the grave. He was well-known throughout the country not only for extraordinary piety, but for the depth and width of his learning, variety of experience, and skill as a great physician. Indeed he was a combination of the Saint, the Scholar, the physician, and the philanthropist. Few such personages appear in centuries. In him was found that width of learning, that variety of experience, that deep knowledge of human nature, that practical sense, that independence of spirit, that simplicity of heart and above all that unbounded love for God and His creatures, which you will not find in any other living man in the whole world. Then he resigned his post and went to Lahore where he studied Persian and Unani System of Medicine. In order to complete the study of Medicine he went to Lucknow and sat for three years at the feet of Hakim Ali Hosain, a celebrated physician of the time. He also studied Hadis, Fiqah, Mathematics, Euclid and Algebra there with several other teachers and became well-versed in all these branches of study. When he was just thinking of leaving Lucknow the Nawab of Rampore sent for Hakim Ali Hussain who took Moulvi Noor-ud-din with him. He studied there for some time and then went to Bhopal for the study of Islamic theology. Then he went on a pilgrimage to Mecca, visited Medina and travelled in Arabia for the acquisition of knowledge. On his return to India he opened a dispensary at Bhera, his native place, and proved a very successful physician, but he cared more for religion than for any thing else, and his was a mind not to be fettered with opinions of the learned divines of the past on questions of faith and religious practice and so the mullahs of the dogmatic school became his bitter enemies. Here began the religious struggle which continued to his last days. Everywhere he got the better of his opponents with his learned and forcible arguments. When he had lived for some years at Bhera an officer of the Kashmere Raj who belonged to Bhera fell ill, came home and was treated by Hakim Noor-ud-din. He was so pleased with the Hakim’s mode of treatment that when he went back to Kashmere he recommended him to the Maharaja who appointed him to be his family physician. Moulvi Noor-ud-din’s learning, piety, and exemplary character won the respect and admiration of the Maharaja as well as the members of his Durbar (Court). His door was always open to strangers, students and the poor. His own mode of living was the simplest possible. He had no separate dress for the Durbar and even on special occasions he did not wear gala dress. His fare was also as simple as that of a quite ordinary man. Every day he used to dine with his poor guests. But he was a great lover of books, for which he spent money like water. When the Maharaja of Kashmere died he went back to Bhera and again settled there and began a splendid building for his residence. Now comes the turning point of his life. While at the Kashmere Durbar he heard of Hazrat Mirza Ghulam Ahmad Sahib and at once started for Qadian to see him. He was a great admirer of Mirza Sahib for his deep piety and burning love for the religion of Islam. Moulvi Noor-ud-din knew that Mirza Sahib was often blessed with revelations from God and that a simple and unostentatious man like him could not be a hypocrite. So when Hazrat Mirza Sahib claimed to be the Promised Messiah and Mahdi in obedience to some commandments which were revealed to him by God, Moulvi Noor-ud-din was the first man to accept him and from that day he identified himself with the movement started by Mirza Sahib and wrote to him that he was ready to sacrifice his life and property. Later on he removed to Qadian, and both the Master and the disciple had such a deep love for each other that they could not think of separation any more. Henceforth he devoted all his powerful energy to the service of Islam by writings, speeches, conversations, teaching of the Quran and prayers. Like his great master he submitted entirely to God and whatever he did he did for His sake. The Quran he believed to be the very Word of God containing in a comprehensive manner the loftiest teachings of all the revealed books of the world and sufficient for the highest development of man, individual and social, moral and spiritual. So his love for the holy book knew no bounds. He was never tired of teaching it. He used to say that it was his food, the element in which he lived. Even on his death-bed when he could scarcely move his hands and feet he felt a new life when he heard the Quran. He lived in an atmosphere of the Quran and created a love for it in men and women, old and young, learned and ignorant. The whole Ahmadiyya community is surcharged with the spirit of the Quran. Even the labourers of Qadian can explain the Quran in a way which extorts admiration from learned Arabic Scholars outside this little village. His love of God found an expression not only through his love of the Quran but through all the commandments of Islam. He was constant at Nimaz or obligatory prayers and remembered God in every breath. He had the most perfect conviction in the efficacy of prayer. Those who were around him know very well how his prayers were wonderfully accepted by the Almighty Allah. He received hundreds of applications for prayers from his followers and others and he was never tired of supplicating the Merciful Allah for the sake of others. His mind was as open as nature itself. He saw the expression of the Divine will not only through His revealed book but through nature and the history of nations. So he studied the history of various nations. He also studied modern European Science and philosophy through translations in Arabic. His library has a wonderful collection of rare books on religion and history. He did not care for books which can be easily had. He read them and then distributed them among poor students. But he took particular care in collecting rare books and spent thousands of rupees for this purpose. There are three libraries in India famous for Arabic and Persian books: at Bhopal, Rampur and Bankipur, but Moulvi Noor-ud-din’s library will yield to none so far as valuable and rare books on history and religion are concerned. His thirst for knowledge continued even to his last days. A few days before his last illness he said that he had just finished two volumes of Charak and Sasrut — books on Indian system of Medicine comprising some three thousand pages. He devoted all he could get for helping the poor, the needy, poor students and other works for the service of Allah. He gave in charity like a prince, but himself lived like a beggar. His dress as well as his food was of the simplest kind. He often used to say “Some of my friends tell me: you do not save anything; you have wife and little children; how will they be maintained after your death? I tell them: God is living, not dead; He is Omniscient; if I serve Him will He not look after my family?” A few days before his death he made a will in which he stated: “My children are very young; God is their protector; there should be no charity fund for their maintenance. Let there be some ‘Karz Hasna’ i.e., unconditional loan which should be paid off by the ablest among the sons.” What a living faith, what a trust in God are expressed through these words? Such words can be uttered by those only who love God and feel the presence of God in every breath. He was so industrious that it appeared he found comfort in work and work only. He was endowed with an exceptionally strong physique and from youth to old age he worked like a giant. Even to his last days he taught the Quran and attended patients. But there was no feverishness in his activity. It was like the smooth flow of a mighty river, never hurrying, never stopping, always going on. There was a calm serenity in his countenance, no hurry, no worry, no weariness. In the midst of his manifold activities he was always cheerful, smiling, never losing his temper. One day surrounded by a crowd of patients and followers and very busy in writing letters, his little son came and upset the inkpot and spoiled many letters and papers with ink; he simply told him “Just see, my boy, what you have done.” The little boy, quite young though he was, hung his head with shame. His spirit of independence was worthy of himself. He said and did what he thought right and never cared for the opinions of others. While he was in the Court of the Maharaja of Kashmere, he always spoke without any hesitation what he thought proper and never shrank from giving expression to his real feeling. Yet this very Noor-ud-din who was a lion in the courts of princes was meek as a lamb in the presence of the Promised Messiah, his spiritual guide. He sat at a little distance and never raised his head, nor looked his master in the face. The Promised Messiah in his turn loved him more than any other disciple and fervently prayed for him and wrote pages after pages in his praise. 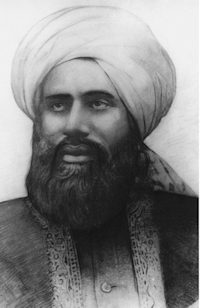 Moulvi Noor-ud-din succeeded the Promised Messiah in 1908 and became the leader of the community founded by him. He had many difficulties as the spiritual head of the movement but he guided his followers with strength, wisdom, patience and tact. As the successor of the great world teacher his one and only aim was to make his followers the true servants of God. The world, the civilised world has lost faith in the Unseen and is sunk in materialism. This saint tried to turn his followers into true Muslims who would be entirely of God and of no other and would hold aloft the torch of faith before the world. He sent Missions to foreign countries, the most prominent of these being the one sent to England, headed by Khawaja Kamal-ud-din, B.A., LL.B., which has done immense good by removing many the prevailing misrepresentations against Islam and has succeeded in gaining a number of converts in high spheres of society.